I have always been a big proponent for individuals purchasing some form of a word processing software the first instance of purchasing a Mac. The software that comes with Mac, TextEdit, is one that I admit doesn’t fulfill many of the word processing needs that many individuals look for. The two big names in the word processing industry are iWork and Microsoft Office. However, for individuals that are looking for a simple type-and-go software, TextEdit does provide some value. If you find yourself having to make use of TextEdit, here are a couple of features in TextEdit that add a bit more value. There are a couple of things about TextEdit that are what we expect and quite normal across all word processing softwares. The interface is actually easy to get a hang of. You have the main area for typing, the top region is helpful for formatting, with the very top available for text style options. Next to that, you have options for formatting your text to be toward the left, centered, or more toward the right. Next to that are options for spacing (double spacing, single spacing, etc), and finally for bullets and other types of listing. Now that the basics are out of the way, now let’s get into a couple of things that may not be apparent to TextEdit users. First off, you can actually add photos and videos into TextEdit. Until now, you might have seen TextEdit as a bit dull and for words only, but this is not the case at all. This is one of the more hidden features because there isn’t an option for this in the menu section. So, you may be wondering how you are able to add multimedia? 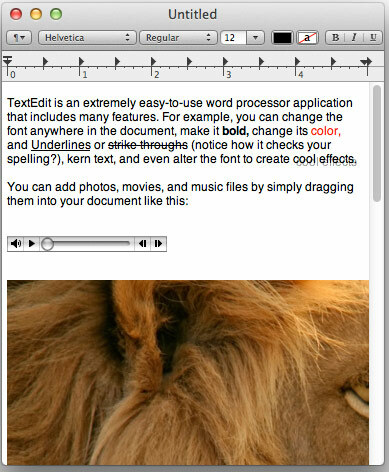 Currently, the only way is by dragging and dropping or through copying and pasting images into TextEdit. Aside from multimedia support, one excuse many individuals have with foregoing TextEdit is adequate spellcheck support. Spellcheck and autocorrect for many of us are the thing that turn our horrible spelling and grammar into masterpieces. 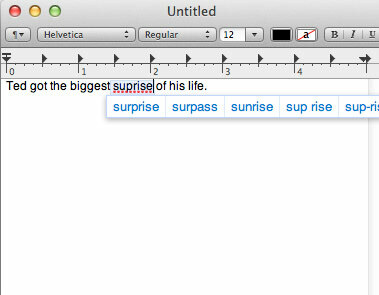 TextEdit also has this masterpiece making feature in their software as well. One hidden feature that is accessible almost anywhere else you go on your Mac is the dictionary tool. This is perfect for getting a definition for a word you are typing. There are two ways to get the dictionary tool, either by highlighting the word, right clicking, and clicking “Look up “[word]”. You can also make use of keyboard tools, have your on screen cursor next to the word, and clicking Command+Control+D. Also, as you go, the normal Apple feature of showing misspelled words throughout your Mac can be helpful, requiring you to right-click on the words unlined automatically in red and clicking suggested ways of spelling the misspelled word. Finally, there is one feature of Mac that allows you to add a creative flair to your text in certain text editing softwares, including Mac’s very own TextEdit. Yes, we know that TextEdit provides its own styles and options within TextEdit, however, you are able to access all fonts in the Fontbook and even fonts you’ve added yourself by highlighting all or at least the text you want to change, and clicking Shift+Command+T. This opens up a full bed of options, from font sizing, to colors, and much more in between. Individuals who view your TextEdit document will be very surprised that the document was created there once you use this hack. Bonus: If you are a developer or just a writer who knows your way around HTML, going into TextEdit preferences and switching TextEdit to “Plain Text” under New Document, and selecting the first option under “When Opening a File” in the Open and Save section, will allow you to type in full HTML. While TextEdit won’t necessarily be the alternative or end-all-be-all of your word processing needs, it at least is a helpful way to hash out quick documents that are visually appealing. Let us know in the comments below which hidden feature is your favorite.